Massive fuzz in a hand-silkscreened aluminum chassis. This hand-painted and assembled ZVex Vexter Fuzz Factory Guitar Effect Pedal has been used extensively by Matthew Bellamy. It can be seen in the pedal tray in his rack used during the Black Hole and Revelations tour. Bellamy frequently plays Manson guitars, some of which have the ZVex Fuzz Factory built into them (supposedly with only the "Stab" and "Comp" knobs on the front of the guitar). "I have the Fuzz Factory. Zvex is a really fun company. I like all their hand-painted stuff. I didn't spring for the hand-painted pedal, but the hand-painted ones it's like the whole thing is done, it's like a unique piece of art. This one just has the name on it like painted on there. But yeah it's a fuzz pedal, kind of like vintage style. It's a real crazy, nasty-sounding fuzz. It squeals. I use it on two songs, so I don't use it a ton. I use it on 'Teenage Sounds' and on the end of 'Trust'." Used alongside a normal ZVex Fuzz Factory pedal. Shown in the source; the silver pedal below the Memory Boy, has ZVEX in large black writing across the back. This photo of Jack Antonoff's pedalboard, taken during a Fun show at The Glass House in Pomona, CA on March 24, 2012, reveals that Antonoff uses a ZVex Fuzz Factory pedal. It can be spotted up in the top-right corner of his pedalboard. At 4:03 in this live Paramore video, one can see a ZVex Vexter Series Fuzz Factory pedal on Taylor York's pedalboard. Frank Iero put this photo on the Instagram with caption :"rad mail day today! psyched on this @zvexeffects fuzz factory"
"And a ZVex Fuzz Factory which for a real broken up, smaller guitar sound," says Barry Stock, at 4:19 in this rig rundown video. If you zoom in on this picture of one of Annie's old pedalboard, shows that she owns one of the ZVex Vexter Series Fuzz Factory Guitar Effect Pedal. In [this interview](http://ocproguitars.tumblr.com/post/60044028021/jessica-dobson-interview), Jessica Dobson lists the pedals she uses, including a ZVex Vexter Fuzz Factory pedal. The Fuzz Factory can be see on one of Ryan's pedalboard in a picture featured on this blog from July 15, 2015. 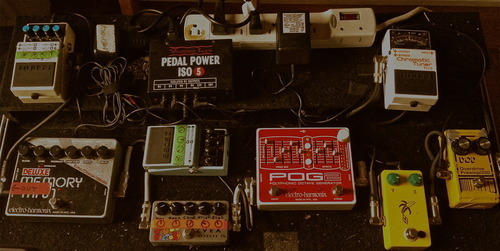 This photo from a 2013 Premier Guitar [article](http://www.premierguitar.com/articles/19620-rig-rundown---russian-circles-mike-sullivan-brian-cook) shows Mike Sullivan's pedalboard, which includes a custom painted ZVex Vexter Fuzz Factory guitar effect pedal. "Pedal-wise, the only real signature sound we used was Travis' Boss Pitch Shifter/Harmonizer for the keyboard delay and modulation for Girl O'Clock. I used various pedals over the years, finally settling on Ibanez TS-series pedals, a Z. Vex Fuzz Factory, a Line 6 Delay Modeler, a wah, and an EQ. All three of us used Boss tuning pedals for the last half of the band's existence." "There's another one, though, it's mine but he has one, too – it's called the Fuzz Factory by ZVex. Plug right into that pedal and you get the craziest, weirdest, most ear-piercing Flaming Lips-type sound." At 19:56 Luke plays us a lick through his Fuzz Factory and mentions that he uses it both live and in the studio. At 9:33 in the video he talks about his trusted zvex Fuzz Factory pedal. 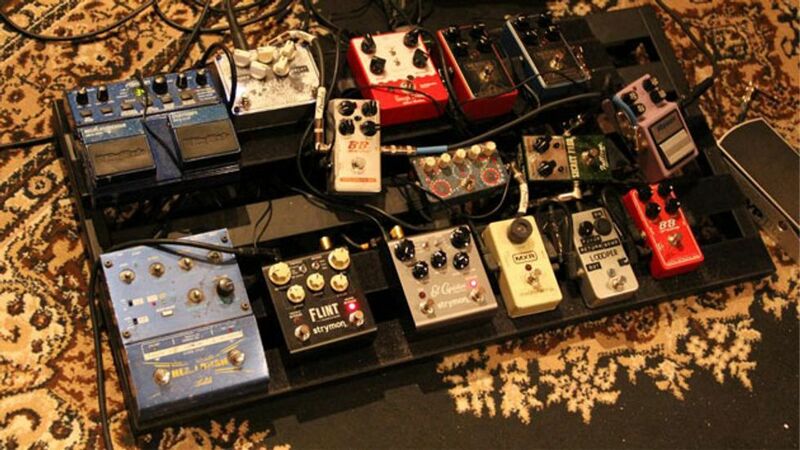 In this tweet, Sondre post a picture of his pedalboard. Jesse likes to crank the fuzz! He uses this fuzz factory for some heavy gain. RAC uses this pedal in his song 'Back of The Car'. In his video Behind The Song: Back of The Car he states that he wanted to "take it up a step" and uses the fuzz factory on multiple guitars playing during the chorus. Can be seen at 0:28 in the video. 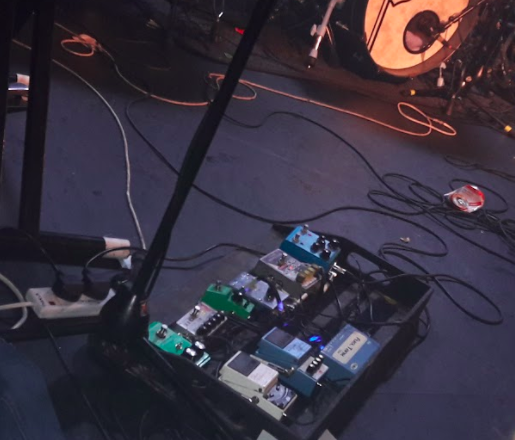 In a photo taken during Superfood's set at Thekla Bristol on 4 October 2017, this pedal is visible on Ryan's pedalboard. You can only just make out a vexter fuzz factory on Joe's board in the photo linked. 15:11 At the beginning of 2017, Javier made some changes to his pedalboard, changed his Boss OC-1 for a Nano POG from EHX and replaced Phase 90 with a Vexter Fuzz Factory from ZVex, previously using a Big Muff from EHX. In this photo gallery there is a photo of Charlie's pedalboard. You can see the ZVEX stamp on the back of one, and if you look closer it has the grass artwork of the fuzz factory vextor pedal. Joey shows his pedalboard for Flying Microtonal Banana in this video at 3:59. You can see the ZVex Fuzz Factory. Fuzz factory is featured in the center of his pedal board in this video. Unsure of the specific Fuzz factory series, however it is branded as Zvex on the front side of the pedal. In minute 19:24 during this performance, there is a shot of Pat's pedalboard. 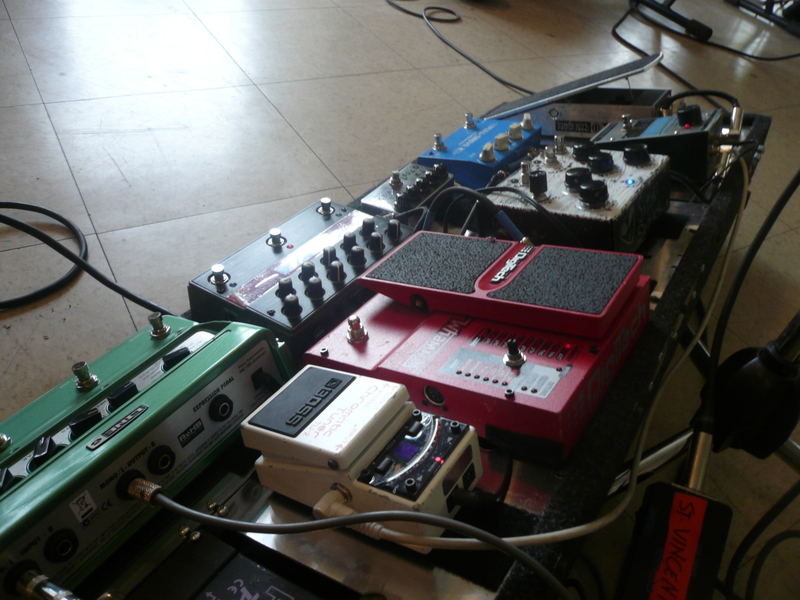 In this photo of Cookie's board, a Fuzz Factory can be seen. On the Instagram post each band member's gear is specified including Erik's pedals. She uses this pedal notoriously on "Linda Martini" LP. The pedal are seen in this live video. Luke Weiler of Positive Mental Trip has been known to use a Vexter series ZVEX Fuzz Factory. Ussually for saturation soaked dirty wet FUZZ rhythms, experimental noise feedback, squeel, static and interesting other interesting sounds for lead solos or layered rhythm guitar parts. Positive Mental Trip rhythm guitar parts are ussually not distorted so the Zvex Fuzz Factory has not been a part of PMT live shows very much. You can def hear the signature zvex fuzz factory sound on some PMT bandcamp demos. 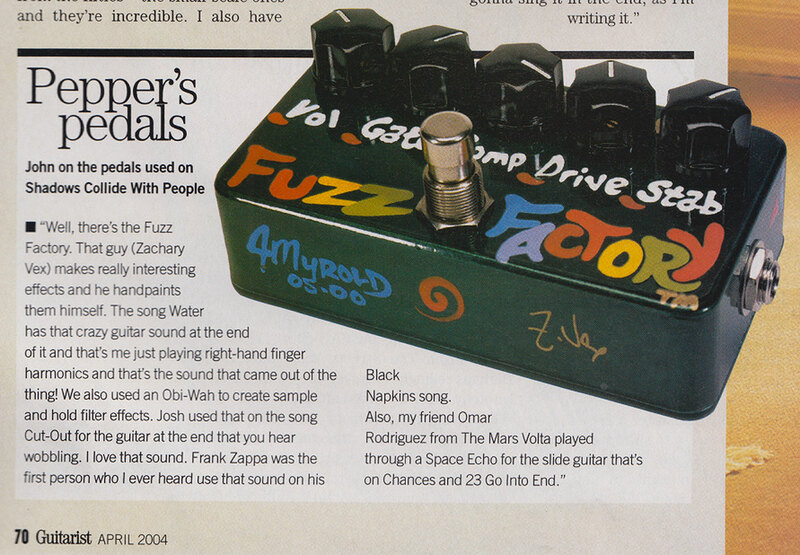 Whether Luke Weiler has actually used the zvex fuzz factory on tracks that amade it on a studio album is unknown. Tim uses the Fuzz Factory on guitars and synths. Utilizing it on a bus to parallel process it with the dry signal. this pedal is the mordern fuzz face,by that i mean people will be making and talking about for the next 50 years! Ok,so I just made two of these and I'm absolutely loving the Fuzz Factory,I've always been a bit trad when it came to fuzzes but when I got asked to make one recently for someone and tested it I comu fall in love with it,I just had to have one of that space age oscillation fuzz on my broad,...a great modern fuzz I think Jimi Hendrix would have adored had it been available in the 60s,I think that pritty much say it all! My first pedal, very good for beefing up solos and if you love big sounds you will love this. This thread is chock full of information. Happy fuzzing! This pedal is sheer and utter ridiculousness. It is capable of both soaring and gorgeous singing tone for solos as well as INSANE and EVIL chugging tones when scaled back. Oh, yeah, and it can sound like it's going to blow your amp up as well as everything else on the block whilst oscilating to and from outer space. This pedal is a MONSTER of a fuzz. I use it regularly in the studio up against an earthquaker Bit Commander and the two go from bitter rivals to great friends. I mention the other because both reflect a class of pedal that is incredibly difficult to tame, but when done effectively can muster amazing results. I ended up pulling this pedal off of my live board, however, as the compromise between usable live volume and controllable oscillation was too hard for me to find or depend upon. I still use this guy when recording, but when I want to be consistent with a single live take, this pedal definitely requires some TLC. So loud I have to keep the pedal volume below 12 to keep from blowing out my amp (not that I'm complaining). A bit dry on most settings by itself, but sounds great with a tube screamer earlier in the chain. All in all, an amazing fuzz pedal. Awesome effect, i played a lot of muse covers and this effect brings it to a higher level. To be honest, I got this one because of it's extensive use on Muse's Origin of Symmetry. Of course all I did at first was turn knobs here and there to make crazy radio-like sounds, but once I sat down to get some actual tones from it I was pleasantly surprised. It can do anything from velcro fuzz to sweet metal tones. That being said, it did take me some time to get a thick guitar tone out of it. Definitely doable, just takes a bit more work. Oh, and it seems to be really sensitive to temperature and humidity changes so it's definitely not set-and-forget. Still, it's the only pedal I haven't sold even after going fully digital. When you hold the reigns using this pedal, you can achieve a variety of controlled fuzz tones, but if you are looking for something more wild and outlandish, just turn down the stab on the pedal and you'll witness a whole other side of this pedal that is terrifyingly amazing. Loud, Unruly, out of control, I love it. Great for experimental and useful fuzz tones. One of my favourite all time classic pedals. Think your tone needs some excitement? This is your pedal. 10/10, can do most fuzz tones perfectly, and with enough messing around and experimenting, any fuzz tone can be marginally achieved. One could see the temperamental nature of this pedal and its dependence on the room, temperature, and humidity as a downside, but in all honesty it is what makes this pedal unique and worth your money. A crazy pedal that surpises every time I use it. Best at glitchy gated fuzz. I build one clone using the original germanium AC128 transistors and it sounds great. This pedal is pretty much the only pedal on this planet the really stretches past and future in fuzz sound design. Buy it if you want to create new laser sounds: Ready for the future. Great dirty fuzz bit a bit to sharp in the high so I combine the fuzz with a EQ behind. My Zvex allows me to talk about things i can't say with words. Second fuzz factory build with silicon transistors, I think the pnp silicons made for better oscillation response really like this version! The fuzz factory has the perfect wild, gritty sound I want in a fuzz pedal. It's extremely customizable, and makes some interesting squeals if you play around with the dials. Its wildness may also be a slight minus, since adjusting this thing live can be a pain if you don't have the exact setting you want memorized, or if you forget to turn down the volume before anything else (seriously, turn down the volume before tweaking). Other than that, I don't think I could be more satisfied. In summary: excellent crazy psychedelic grit & sound, not the pedal for you if you just want basic fuzz to plug & play without any knob tweaking. Most fun pedal that I've ever used!!! I totally love this pedal. But I thing that is not for everyone. If you're looking for something anarchic, a little unreliable, difficult to control and setup... this pedal is for you!!! At the moment everything that I've said sound wrong, but let me explain... by anarchic I mean that the way that the sound comes out of this pedal is like trying to ride a savage stallion, probably you'll never control it totally but both will learn to understand and respect... and with that a relationship almost symbiotic will emerge. It's unreliable and difficult to setup because you need to check where to put it in your effect chains, also you need to careful set up your amplifier. I neglected most of the parameters in the amp (just using gain and volume) because the pedal can create so much fuzz that the process of finding the right tone can be difficult for your ears, but believe me is super fun. About the parameters... even the instructions say something like "each knob controls most of that aspect of the sound, but not totally" meaning that there are other ways to get a sound with more compression, fuzz, volume not using directly the "vol" gate. In my short experience I can give you some tips... "stab" move it all to the right, if you move it to the left you'll get weird and annoying noises (which I love) that comes from stabbing a part of the signal, it's cool but not for everyone. I think that I'll adjust this parameter at the end if needed. The "gate" knob can add of remove some cool background noises like a drive, if you move it all to the right you won't hear them, but if you move it to the left you'll start hearing them. "comp" and "drive" are self explaining and "vol" is like a gain... it can give you a huge amplifying sound so use it wisely. Aaaah! one last thing, the battery, I read that it can last for years!!! which is cool if you don't want to carry your whole pedal board or an external power source and you only need this effect to jam with your friends or whatever. I had this pedal for a while. It can sound great, and it can sound like the worst possible thing you can put on your pedal board. I love the fact that it's so crazy you can pick up radio stations on it, but especially for a live setting, it's just way too fidgety and tweakable for a lot of people.